reaping the fruits of oppression…. A few parents have been on the news recently because their kids joined ISIL or other cults. The scary part is that the kids were just so regular and so average as were the families and we may be tempted to say it could happen to anyone. But as parents we can fight and prevent it. We can do something, anything and stop our kids from feeling so hopeless and easy prey to these cults. The first step to cult/gang proofing our kids is spending time with them and building up their individuality. They do not need the latest toys or gadgets as much as they need us. We can teach them to revel in their own quirks and let them know that stranger danger includes religious fanatics and gangs. We should tell them the truth about scary topics otherwise they will get their truth elsewhere. We must stop trying to make them fit in with others, celebrate their awkwardness, absurd humor and abstract art and music. We should let them develop their own voice and celebrate each assertive gesture. It’s so easy to blame the environment when we had at least 10 years to cult/gang proof our kids but failed because we were too busy chasing money, career or prestige. No one cries for me! No one cries for me, my short life not even worthy of a hashtag or footnote as leaders and future leaders rally for electoral votes. I am not Charlie, just a nameless faceless child burned to a crisp and left like trash in the charred remains of my town. No one cries for me, not even the mother who took time to wash my hair and plait it in perfect rows, her burned body lies besides the hundreds of relatives friends and enemies equal in agony and death. 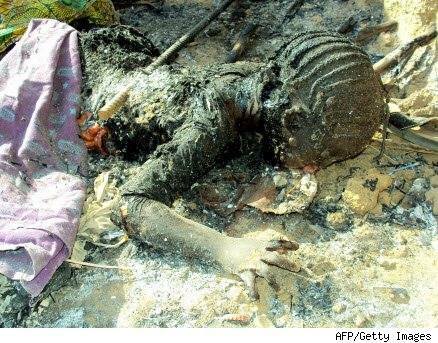 No one cries for me, no one cries for us, we remain faceless roasted flesh, unholy sacrifices on the altar of Boko Haram. Cry for me and Baga Nigeria. Raise dirges and ululate for the children kidnapped (or sold) and strapped with bombs, unwilling messengers of death. Look at my body as you pray and do something, say something, change something. Was my life in vain?